Each painting or drawing I have made over the years usually disappears into its own secret place, perhaps within a portfolio, a drawer, a private/public collection or simply my memory when a collector contacts me. Which is what often prompts me to re-engage with an older work just for a clue to who/where I was when it was made. 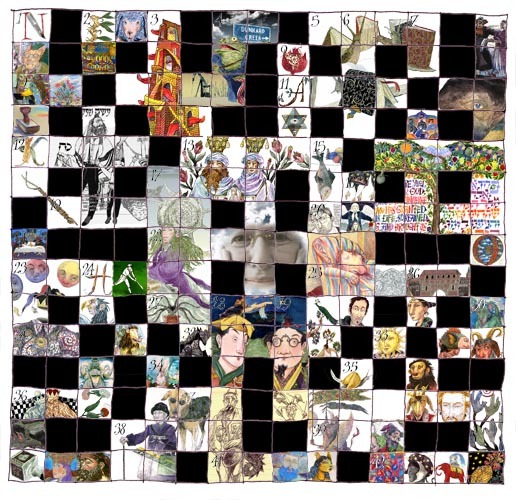 This idea was translated graphically (see below) when I set up The Magic Eye Gallery(www.magiceyegallery.com)last year. August 26, 1998-The image shown above actually began about ten years ago as a sketch entitled ‘Sushi Under Clouded Moon’ following business trips to New York and Los Angeles, where my taste for these Japanese delicacies developed. I have always admired the spare, yet colorful sensuality of Japanese graphic design and the ways in which this sensibility translates to every aspect of that culture… particularly the presentation of food. The finished painting was put on hold in deference to a continuous stream of other projects, both personal and professional, yet always came to mind when I found myself in a Japanese restaurant. On a recent trip to NY, I made a few sketches of the restaurant staff and customers in such an establishment and considered these experiences part of my ‘research ‘. 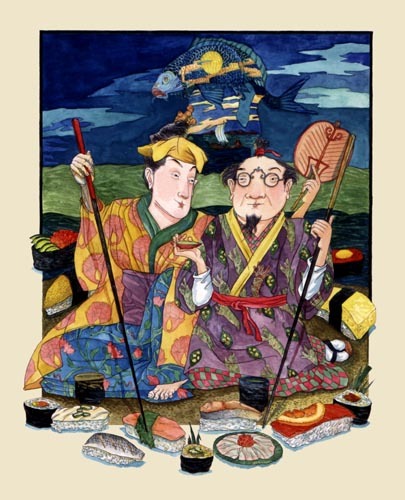 This year at last, everything seemed to come together; the choice of watercolor as the medium and the images of Madame Ginger and Master Wasabi … exchanging spicy stories of their travels amidst a feast of sushi. The tiny fisherman, guiding his craft on silky waves, is the eternal Guardian of The Sea of Tea. The original art and gicleé prints of Sushi By The Sea Of Tea may be ordered at The Magic Eye Gallery: http://www.magiceyegallery.com.